I met Karan in London, where we were both pursuing further studies. We had the perfect love story but marriage was something in the future, some way off. When I got back to Delhi, my family started talking about my wedding. Karan was younger than me and not ready to settle down but he agreed because of the pressure from my family. His parents also felt that he was too young to settle down. Eventually, everyone did agree. My happiness knew no bounds and I was on cloud nine - I was finally getting married to the man I love! Now ,all the shopping and the excitement began. I was hoping that his mom would take me with her when she goes to buy things for me, but that never happened. I was okay as I thought that she must have got an idea of my taste and would obviously get things for me that I would wear. As per the tradition in his community, on the engagement day the bride wears an outfit given by the boy’s family. My mother-in-law asked me to go a boutique in Shahpur Jat and give measurements for my blouse. I was not shown the outfit. I thought that maybe she wants to keep it as a surprise, so did not say anything about it. The day I received my outfit, I was surprised and trust me it was not a pleasant surprise - my outfit was UGLY! I did not want to wear it. I prefer pastel shades and delicate embroidery. But my engagement outfit had a strange mix of colours on it and was nowhere close to anything I would ever wear. I have a petite frame and loud embroidery never looked good on me. But my mom calmed me down. She explained to me that nothing could be done about it now and it was better if I wore the outfit with a smile on my face. I agreed, I did not want to start on a wrong note with my in-laws. So, I wore the outfit for my engagement. But, there was something worse in store for me. 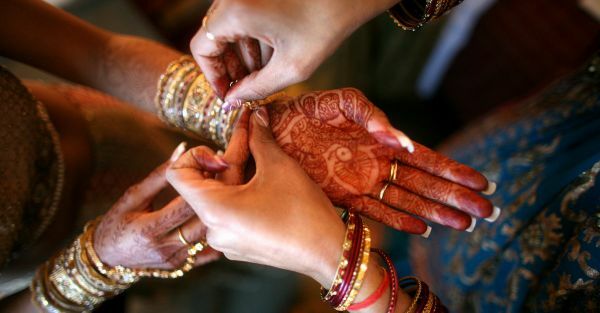 As per tradition, the boy’s family gives ‘shagun’ to the bride in the form of jewellery. My mother-in-law had chosen a set for me that would match my outfit, so you can imagine what it was like. It was completely unlike my own taste. At that moment, with so many people watching while his mom was helping me wear the set, I could not say anything and had to keep smiling. My mother had seen my expression and knew exactly what was going on in my head. As soon as the ceremony was over, I went up to my mom and started howling. The pressure of the wedding along with the emotional upheaval of leaving my home in two days and then having a mom-in-law who did not understand me made me howl. Plus, I had been dying to get married and did not want my engagement pictures - with me in a lehenga and jewellery not of my choice - to come out. I think it is natural that every bride wants to wear things of her choice on her wedding and wants to look the best. My mom consoled me. She calmed me down and told me that these small adjustments come with marriage. After the wedding, my mother-in-law kept asking me to wear the engagement set for various family functions but I always changed the topic. Karan has also been extremely supportive of me and understands why I do not want to wear it. Maybe I was immature at the time to react the way I did, but today I’ve been married for 10 years and each time I look at my engagement pictures, I just have a good laugh. My mother-in-law was not wrong in buying me things, but I feel that when you are making such a big investment, it is important to consult the person who has to wear the clothes and the jewellery. Probably people in her generation don’t think like that, but when my son gets married I know that I am going to make sure his wife is a part of all the wedding shopping.